The Almagor Terror Victims Association and a group of bereaved families, whose loved ones were hurt in terror attacks on Route 443, plan to demand another High Court discussion, this time with an extended panel of judges, following the court’s decision to allow Palestinians to use the road. The Yesha Council on Saturday night congratulated the IDF on its elimination of the terrorist murderers of Rabbi Meir Chai. “The soldiers and commanders showed bravery, daring, and an exemplary fighting spirit. This is the only way to fight terror. The terrorists were prisoners in Israel who were released, and the government would do well if it internalizes the lessons involved,” the Council said. The Almagor terror victims’ group said that the victim, Rabbi Chai, “paid with his life for three failures of the Israeli defense establishment: The release of terrorists who were involved in previous attacks, the pardons given to a senior terrorist who had participated in many attacks, and the relations with the Palestinian Authority/Fatah/Tanzim terror groups,” an Almagor statement said. General Security Services in partnership with soldiers of the Israel Defense Forces (IDF) killed the murderers of Rabbi Meir Avshalom Chai. General Security Services in partnership with soldiers of the Israel Defense Forces (IDF) killed the murderers of Rabbi Meir Avshalom Chai. All three were convicted terrorists who had been committed to and later released from Israeli prisons. Chai, 45, was murdered by Arabs in a drive by shooting while chauffeuring his wife and one of their children in their family car, between Shavei Shomron and Einav. The Israeli military operation took place on the evening of December 25, the Jewish Sabbath. PA head Mahmoud Abbas was not forewarned of the mission. The homes of three men known to have taken part in the murder were surrounded by special forces units, who tried to arrest them. According to an army spokesperson, the men “refused to cooperate”, rejecting calls to surrender. Troops subequently opened fire on the buildings. Nader Raed Sukarji, a 40 year-old inhabitant of Shechem, was arrested in 2002 and suspected of being a top Al Aksa terror group brigade operative and participant in many terror attacks. He also prepared bombs and helped establish explosives factories in Nablus (Shechem). He was released from prison in January 2009. Palestinian sources say Sukarji’s wife was also injured in the operation, after her husband used her as a human shield while hiding in their house. Anan Suleiman Mustafa Subih, 36, resident of Nablus, was an operative of the “Shuhada al-Aksa” brigade, which was involved in extensive Tanzim military operations as a cell of Tanzim in Nablus. The group was led by Nayef Abu Sharkh, until Nayef’s death. Subih worked in trafficking weapons and supplies for use in terror acts. Subih had recently been accepted to Israel’s amnesty program for Fatah gunmen. His participation in Tanzim activity was a direct violation of that agreement. In the process of attempting to arrest Subih, Israeli forces found 2 rifles and 2 guns hidden in the house. The weapons have been transferred to police laboratories to determine if they were the ones used to kill Rabbi Chai. Palestinian Authority Prime Minister Salam Fayyad condemned the IDF operation in Shechem, saying it would hurt the Palestinian ability to achieve stability and security. Terror organizations swore they would take revenge for the operation. CEO Meir Indor of the organization representing terror victims, Almagor, praised the army’s mission, but is urging citizens to contact the Defense Minister’s office and demand a cessation to the release and pardon of terrorists. He says the government should re-evaluate its relationship with the PA leadership, claiming that the PA leaks information, training, and arms to Tanzim terrorists on a regular basis. The shooting attack Thursday in which Meir Avshalom Hai, a 45-year-old resident of West Bank settlement of Shavei Shomron, was killed, enraged many settlers and right-wing activists, who blamed the government for the tragic event. “Every time we try to appease the Palestinians, whether with removing roadblocks or with freezing the construction in the settlements, they interpret it as a weakness on Israel’s part , and only increase terrorist activities,” said MK Nissim Zeev (Shas) while visiting the scene of the shooting. MK Zeev noted that there used to be two roadblocks on the road where the shooting took place, and claimed that if the roadblocks had not been removed, the attack could have been prevented. “Even if a terrorist gets through, it would have been hard for him to escape due to the roadblocks,” he said. Among the government critics were also terror victim organizations, which have been battling against the prime minister’s intention to release hundreds of terrorists as part of the prisoner exchange deal that will see the release of kidnapped soldier Gilad Shalit. “The attack today was a promo to the murders that will take place if a thousand terrorists are released,” said representatives of Three Fathers organization, which represents bereaved parents whose children were killed in terror attacks. The organization called on the heads of Yesha Councils to join their struggle against the release of terrorists as part of the Shalit deal. Almagor Terror Victims Association also published a statement, in which it urged the PM to seize negotiations with Hamas, and look for “creative solutions” for the release of Gilad Shalit, which do not involve the release of murderers. 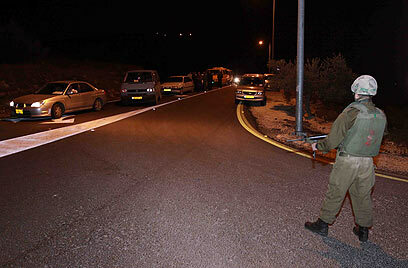 Thursday night saw many friends and family members arrived at Hai’s home in Shavei Shomron. Sarah Eliash, a resident of Kedumim settlement, knew the family well. “Meir Avshalom Hai’s wife, Elisheva, is currently on maternity leave with a 2-month-old baby,” Eliash told Ynet. Shavei Shomron spokeswoman, Menora Chazani, told Ynet the Hai was the childrens’ Rabbi, and used to teach them Talmud and Torah in kindergarten. “He would buy the children sweets and surprises, and teach them to sing. The kids admired him, and still do,” Chazani said. Earlier, the IDF tried to block MK Michael Ben Ari from arriving at the scene of the attack. Ben Ari stopped his car and approached the area by foot, while using his immunity. “Those who speak of easing the restrictions on Palestinians’ movement needs to realize MKs also have the freedom of movement,” he said. The Almagor umbrella group of terror-victim associations called Thursday night on Prime Minister Binyamin Netanyahu to stop negotiations with Hamas and seek creative solutions for the release of abducted soldier Gilad Shalit that don’t involve prisoner releases. Despite the fact that Israel has communicated its position on the burgeoning prisoner exchange agreement to the German mediator, it will take at least 10 days or a few more weeks before a deal for the release of captive soldier Gilad Shalit is sealed, Ynet learned Tuesday night. Hamas has yet to relay its position, and before it does one of its representatives is expected to meet with the group’s exiled leadership in Damascus. German mediator Ernst Uhrlau is scheduled to return to Germany for Christmas and return to the region at the beginning of next week. Uhrlau was expected to cross into Gaza late Tuesday night in order to present Israel’s position to Hamas. A number of senior Hamas figures said the Islamist group wants to advance the negotiations and would seriously consider Israel’s proposal, in part due to heavy pressure exerted by families of Palestinian prisoners. Among the hundreds of prisoners Israel is willing to release are terror leaders who had been given life sentences. Jerusalem’s demand that these terrorists be deported to Gaza or abroad has already been relayed to Hamas’ leadership in Gaza. Earlier Tuesday, Arab sources familiar with the negotiations told Ynet that Uhrlau has asked Israel to reconsider its reservations in order to push the deal. According to the sources, Jerusalem’s demand to deport dozens of prisoners indefinitely and its refusal to release several leaders – namely Marwan Barghouti and Ahmed Sadat – as well as its refusal to free jailed Israeli Arabs, are “too much” for Hamas to accept. Meanwhile, Egypt is pressuring Hamas to make further allowances, Arab sources said. Also on Tuesday, Prime Minister Benjamin Netanyahu’s national security advisor, Uzi Arad, apologized to IDF Chief of Staff Lt.-Gen. Gabi Ashkenazi for saying he was acting like the “chairman of the soldiers’ parents’ association” during the negotiations for Shalit’s release. After failing to devise a military option to retrieve Shalit, both Ashkenazi and Shin Bet security service chief Yuval Diskin are hoping that the negotiations succeed, while Arad and Mossad chief Meir Dagan believe Israel should not accept Hamas’ demands. Earlier in the day Netanyahu met with representatives of terror victims and bereaved families for an hour-and-a-half in light of the progress being made on a prisoner swap for Shalit. Prime Minister Benjamin Netanyahu met with representatives of terror victims and bereaved families for an hour-and-a-half Tuesday evening in light of progress being made on a prisoner swap for kidnapped soldier Gilad Shalit. Yossi Zur, whose son was killed in a suicide attack on a Haifa bus in 2003, called the meeting “difficult and serious,” adding “we got the impression that nothing has been finalized. We conveyed the message that the deal is dangerous and that there are other ways. Prior to the meeting, Zur, Yossi Mendellevich and Ron Karman said they would try to convince the PM not to go through with the deal. “We will ask him to think of the children and of the Israeli nation as a whole, and not put us in harm’s way. We hope he’ll listen,” said Zur. The Almagor Terror Victims Association is heading the campaign against the release of terrorists as part of the burgeoning prisoner exchange with Hamas. The group’s director, Meir Indor, as well as other members of the organization protested outside the Prime Minister’s Office in Jerusalem Monday evening as the forum of seven senior cabinet ministers convened to discuss the details of the deal. A rally in favor of a prisoner swap was simultaneously held nearby. Speaking to Ynet, Indor claimed an agreement with Hamas would lead to the death of many Israeli citizens. “Who will look into the eyes of those who will be kidnapped or murdered by the (arch-terrorists) who are on the list (of Palestinian prisoners slated for release)? He said. Earlier Tuesday, Defense Minister Ehud Barak claimed that the price continues to rise in prisoner exchange deals. “In the past twenty-something years, the State of Israel has been on a slippery slope of deals, from the (Ahmed) Jibril deal to the (Elhanan) Tennenbaum deal. Even the return of the bodies of (Ehud) Goldwasser and (Eldad) Regev,” he said. “This is a slippery slope, and there is no choice but to stop it. The Israeli government must change its policies on such deals. However, at the moment there is a given situation that did not begin during the tenure of this government. “The path must be changed and another position must be formed, we must ask ourselves whether it is right to release a specific soldier who is there and was kidnapped three years ago and examine his case, or examine the context as a whole,” Barak said. The Almagor anti-terror group said it would appeal to Prime Minister Binyamin Netanyahu at a meeting Tuesday night to stop the indirect negotiations with Hamas over the release of kidnapped IDF soldier Gilad Shalit in exchange for some 1,000 terrorists. Almagor said it would ask Netanyahu to seek to release Shalit using means other than releasing terrorists, such as cutting off the power and water to Gaza, and halting the supply of money to the Hamas terror government. The group also said it would demand that the government release the names of terrorists to be freed in the deal before any decisions are made. Almagor officials will meet with Netanyahu Tuesday night, along with members of families who have lost loved ones to terror attacks. Israelis who lost siblings to Arab warfare write to PM – who himself similarly lost a brother – asking not to free 1,000 terrorists for Gilad. A group of people who have lost siblings to Palestinian terrorists or in war have written to Prime Minister Binyamin Netanyahu – who himself similarly lost a brother – asking him not to release 1,000 terrorists in exchange for abducted IDF soldier Gilad Shalit. One of the bereaved siblings, Bentzi Ben-Shoham, whose sister Limor was murdered along with 10 others in the March 2002 attack at Café Moment in Jerusalem, spoke with Arutz-7’s Hebrew news magazine about the letter and about his relationship with the activists working in favor of the release. Netanyahu, who in these hours and days in the throes of the life-and-death decision-making process regarding Shalit and the terrorists, lost his brother Yonatan in July 1976. Yoni, as he was known, commanded the operation to rescue over 100 hostages held in Uganda, and was the only Israeli soldier killed during the raid; three hostages and all of the Popular Front for the Liberation of Palestine (PFLP) terrorist abductors were also killed. At the same time, Ben-Shoham feels a sense of obligation towards Gilad Shalit, the young soldier who was kidnapped and has been held captive by Hamas for three and a half years. “Gilad must be returned,” Ben-Shoham said, adding that he had helped the pro-Shalit activists in their protest tent. Mr. Netanyahu, if you choose to give in to terrorism, what is the meaning of your brother Yoni’s life? What is the meaning of the risks that he took upon himself, and that many other soldiers and families took upon themselves? … For many years, you have been the steadfast rock upon which is based the opposition to giving in to terrorism. [Netanyahu is the author of some of the first books on the topic – ed.] If you fall, who will be able to stand up to terrorism? And who will be to blame for the rivers of blood that will be spilled here as a result – our own blood, and that of our children? Please do not let us down. Do not disappoint your nation and those who voted for you. Shalit Deal: Gearing for the Final Stretch? Members of the Shalit campaign are gearing for what may be the last act in a long battle. In wake of three special seven-minister cabinet meetings which ended with no result on Sunday night, and ahead of another meeting set for Monday morning, both those fighting for the Hamas-held soldier’s release and those who oppose a deal which will set arch-murderers free, know that this is the final stretch. The Shalits then joined members of the campaign who rallied outside the Prime Minister’s Office in Jerusalem. Members of the reservists’ campaign also relayed a letter to the Netanyahu, in which they urge decisive action: “In these crucial moments we expect you to show leadership and maneuver the negotiations for Shalit’s release with perseverance and determination. “We remind you that his fate will mirror Israeli society’s ethical resilience.” Attached to the letter was the campaign’s petition, signed by 4,700 reservists. Meanwhile, the Almagor Terror Victims’ Association and other groups opposing the deal, have stepped up their efforts to stop any prisoner exchange. Dr. Aryeh Bachrach, head of the Bereaved Parents’ Forum, called on those opposing the deal to pressure Netanyahu and the cabinet ministers using any means possible, suggesting they “bombard” the respective offices with phone calls, faxes and emails. “This is a counter-initiative to the pressure the prime minister in under to make what we feel is the wring decision. We’re all for Gilad’s release, but not at the expanse of releasing arch-murderers,” he told Ynet. Weeks of speculation on a proposal in the making for Israel to free hundreds of terrorists for the safe return of kidnapped IDF soldier Gilad Shalit are at a climax as an emotionally taut nation takes sides. The mini-Cabinet of seven ministers met Sunday night for the third time in one day on the issue, without reaching a decision, and Prime Minister Binyamin Netanyahu will bring up the proposal before the Cabinet again 9:30 Monday morning. The mini-Cabinet includes members whom Prime Minister Binyamin Netanyahu has depended on to keep discussions secret, without leaks to the media. However, Channel One television reported that Prime Minister Netanyahu is against the proposal while Defense Minister Ehud Barak favors it. The family of Shalit and relatives of terror victims continued to take opposite sides on the principle of Israel risking more terrorist attacks and kidnappings by freeing terrorists. The Almagor terror victims association repeatedly has pointed out that previous releases of terrorists have resulted in the murder of at least 179 Israelis at the hands of the same terrorists who promised not to return to violence. The family of Shalit made another emotional appeal to Prime Minister Netanyahu Sunday, expressing fears that a rejection of any proposal would leave their son to be “Ron Arad number two,” referring to the plane navigator whose fate has been unknown since his plane was downed over Lebanon more than two decades ago. Both Almagor and the family of Shalit send letters on Sunday to the Prime Minister. 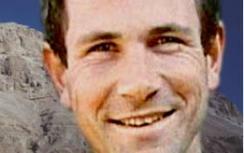 Terror victims’ families reminded him that his brother, Yoni Netanyahu, gave up his life while leading elite commandos to free kidnap victims in the dramatic rescue at Entebbe in 1976. An equally emotional appeal by Noam and Aviva Shalit, parents of the kidnapped solider, included the plea “not to repeat the tragedy of Ron Arad. G-d forbid we [should] add to this wound which was seared onto Israeli society, and has seen sorrow for generations,” they wrote. The seven ministers in the mini-Cabinet are reportedly divided. One of the members, Foreign Minister Avigdor Lieberman, chairman of the Israel Our Home (Yisrael Beiteinu) parry, has vowed that terrorists with blood on their hands will not be freed. Liked Minister Benny Begin also is said to agree with him. Deputy Prime Minister Dan Meridor of the Likud has backed freeing prisoners. The rumor mill continues to spin with different versions of what is being considered, but no one has officially confirmed or denied several conflicting reports. The Almagor terror victims group says it will file charges in Britain for the arrest of Arab terrorists under the laws used to threaten MK Livni. The Almagor terror victims group says it will file charges in Britain for the arrest of Arab terrorists who visit the country, under the same laws used to take aim at Knesset Member Tzipi Livni of the Kadima party. Almagor director Meir Indor said the group will also sue British officials over the country’s cooperation with Arab terrorists during the Mandatory period, when Britain failed to prevent Arab mobs from murdering Jews. He announced that it has begun to collect information from families of terror victims from the pre-State days, as well as background information on the top officials of the Palestinian Authority. The charges will mirror those that were brought against the State of Israel for failing to prevent the massacres in the Sabra and Shatila refugee camps in Lebanon during the 1982 Peace for Galilee Operation, also known as the First Lebanon War. At that time, the Lebanese Forces Christian militia entered the camps, populated by Palestinian Arabs and some Lebanese civilians, and slaughtered hundreds. This had followed the recent assassination of their Christian Phalangist leader and president-elect, Bashir Gemayel. The IDF, which at the time surrounded Beirut’s Palestinian refugee camps, had allowed the Lebanese Forces militia to enter the two camps in order to clear out PLO terrorist nests – and Israel was blamed for the massacre. Indor noted that his group has a great deal of experience in the European public court system. For instance, Almagor once filed a lawsuit in a Belgian court against then-PLO terrorist chairman Yasser Arafat, who had filed criminal charges against Israeli statesman Ariel Sharon. Indor said this prompted a legislative process that led to the end of both cases. “Belgium took advantage of the charges against Arafat in order to close both of them,” Indoor said. Indor is also convinced that Almagor’s efforts in Spain helped stymie a similar effort against Israeli security personnel. In that case, the group began to open an investigation in Yugoslavia on a NATO bombardment that had allegedly involved Spanish troops. The Almagor terror victims group said Tuesday that it would file charges of its own in Britain against Arab terrorists. Taking advantage of the same laws that Arab activists used to produce an arrest warrant against Tsipi Livni, Almagor said it would file charges to demand the arrest of terrorists who often visit Britain. Almagor director Meir Indor said that the group would also sue British officials over cooperation with Arabs terrorists during mandatory times, when they failed to prevent Arab mobs from killing Jews, similar to the charges that were brought against Israel for failing to prevent the Sabra and Shatilla massacres during the first Lebanon war. Students at a number of pre-military academies sent letters to Prime Minister Benjamin Netanyahu and Defense Minister Ehud Barak yesterday expressing reservations about a deal taking shape for the release of kidnapped soldier Gilad Shalit. The letters from students in Yated, the Upper Galilee, Yatir, Kfar Adumim and Eli called on the leaders not to make their decision in the case as a result of public and media pressure, and to come to a clear uniform position on prisoner release deals in general. They also expressed their willingness to serve in the Israel Defense Forces irrespective of the ultimate terms of a deal on the Shalit case. The High Court of Justice yesterday turned down a petition by bereaved parents and Almagor, an organization representing victims of terrorism, seeking the publication of the criteria for the release of prisoners in connection with a deal for Shalit. As a result, the details of a possible deal for Shalit’s release will remain under a media blackout. The justices added that they heard out a representative of the defense establishment on the issue. “From this hearing the special nature of the process became clear to us, which involves special sensitivities in light of the need to obtain the release of the kidnapped soldier without endangering his life – and in light of the required effort to [ensure] that the ‘price of the deal’ does not actually and substantially harm the security of the state,” they said. Among the petitioners before the court were three parents whose children were killed in a 2003 terrorist attack on a bus in Haifa. The parents contended that the failure to release details of an impending deal makes unbiased public debate on the agreement impossible. A senior Hamas official told the London-based Al-Hayat newspaper that the differences with Israel on a deal center around 50 names among a list of 450 prisoners whose immediate release Hamas is seeking. According to the report, the 50 include three women involved in terrorist attacks as well as several high-ranking prisoners, among them Marwan Barghouti. Israel, the paper reported, has agreed to the release of 17 prisoners from East Jerusalem but demands that 10 of them be exiled abroad. According to the report, Israel is demanding that a total of 130 of the prisoners be exiled, a demand that Hamas reportedly is rejecting, in favor of a smaller amount. Meanwhile, Gilad Shalit’s parents, Noam and Aviva, continued their round of meetings that they began last week with cabinet ministers, seeking support for a deal for their son’s release. The High Court of Justice on Tuesday rejected a petition filed by bereaved parents and the Almagor – Terror Victims Association, who demanded that the state make public a list of Palestinian prisoners it plans to release exchange for kidnapped soldier Gilad Shalit. The judges explained that they did not have the right to interfere with decisions made by the IDF censor, adding that they were convinced that “obvious security concerns” were behind the decision not to publish the list of prisoners slated for release. The judges, led by Supreme Court President Dorit Beinish, said in their ruling, “Undoubtedly, the steps being taken to advance Shalit’s release present dilemmas that are difficult and complex from the human, moral and security-related aspects. “(These dilemmas) warrant public debate, but we cannot ignore the unique nature of the process, which still involves some very sensitive issues,” said the judges. During Monday’s court hearing, Yossi Mendelevitch, the bereaved parents’ representative said, “We do not recognize the (government’s) right to withhold information from the public. “Is the State of Israel, which betrayed us when it failed to protect our children, betraying us once again by not allowing us to know what is going on with those who murdered our children?” he said. Shalit was captured into Gaza by Palestinian terrorists on June 25, 2006. Court: Details of Shalit swap must stay secret; Report: Israel to free 17 East Jerusalem Arabs in deal. Students at a number of pre-military training academies on Tuesday urged Prime Minister Benjamin Netanyahu not to release hardened Palestinian terrorists in order to secure the release of abducted Israeli soldier Gilad Shalit. “We believe there is a need to stand steadfastly against the rising outburst of feelings, which is sometimes likely to be a bad advisor,” they wrote in a letter they also sent to Defense Minister Ehud Barak. Nonetheless, the students added that they would still enlist in the Israel Defense Forces, irregardless of whether such a deal is carried out. Meanwhile, the High Court on Tuesday rejected a petition to release information about the developing deal for Shalit, ruling that such a move would run counter to security considerations. Three bereaved parents filed the petition in conjunction with the Almagor Terror Victims Association, arguing that the military censorship over the deal was preventing them appealing against it. The parents said they wanted to know whether those who killed their children would be included in the prisoner swap with Hamas. They said the figure explained the reasons for the heavy censorship for an hour, during which the justices asked him about those details the state refused to disclose for security reasons. “During this session, we understood the unique nature of this process, which is especially sensitive due to the desire to secure the release of the abducted soldier without endangering him, and in light of the efforts necessary to ensure that ‘price of the deal’ will not substantially and significantly harm national security,” they said. Meanwhile, the London-based Al-Hayyat daily reported on Monday that Israel would free 17 prisoners from East Jerusalem as part of the deal with Hamas. Ten of those prisoners will be exiled once released, according to the report. The differences between Israel and Hamas reportedly hinges on 50 prisoners, among a list of 450 names, which Israel refuses to free. Al-Hayyatreported on Monday that Israel is also not prepared to release five women prisoners who were sentenced to life terms. Hamas Interior Minister Fathi Hamad said on Monday that his organization is working on the assumption that the deal to free Shalit will be carried out within two weeks. Al-Arabiya television reported that the German intermediary in the case arrived in Gaza on Tuesday to provide Israel’s latest response on the Shalit case. According to the report, the mediator will meet with Hamas representatives, but will only receive their response following consultations between Hamas leadership in Gaza and Damascus. Meanwhile, Gilad Shalit’s parents, Noam and Aviva, on Monday continued their round of meetings with cabinet ministers that they had begun last week in an effort to convince them to vote in favor of a deal for their son’s release after three years in Hamas captivity. Officials at the campaign to free Gilad Shalit continue to maintain their media blackout. Israel and Hamas agreed on the names of 400 prisoners to be freed in the first phase of an exchange deal for the release of captive soldier Gilad Shalit, but a dispute remains over the names of 50 additional prisoners, a Hamas official told al-Hayat newspaper. According to Tuesday’s report in the London-based Arabic languages newspaper, the official said that a dispute remains over the release of three female Palestinian prisoners – Amneh Muna, convicted of the murder of Ofir Rahum eight years ago, as well as Ahlam al-Tamimi and Qahira a-Saadi. Other disputed names include Tanzim leader Marwan Barghouti, Secretary-General of the Popular Front for the Liberation of Palestine, Ahmed Saadat, and a number of officials from Hamas’ military wing, including Ibrahim Hamed, Abbas a-Sayyid, Abdullah Barghouti, Jamal al-Hijja and Hassan Salameh. 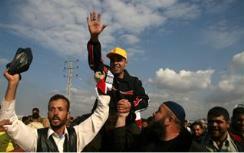 In addition, negotiations are ongoing over the release of Arab-Israeli and east Jerusalem prisoners. According to the report, Israel has agreed to include 17 east Jerusalem prisoners in the deal, out of which 10 are to be exiled out of the territories. The source also said that Israel has proposed to expel 130 prisoners, but Hamas objects and is working to minimize the number. According to the source, the decision of expulsion will depend on the prisoners themselves. The source further added that intensives takes were ongoing, and that the German mediator is remaining in Israel to finalize the deal. On Sunday, the State said at a High Court of Justice hearing that it would release 980 prisoners as part of the impending exchange deal. The court heard a petition by bereaved parents and the Almagor Terror Victims Association demanding the list on prisoners Israel plans to release as part of the deal be published. The parents argued that the State was turning its back on them, but Supreme Court President Justice Dorit Beinish said that she had heard that in the meantime, there is no deal. Supreme Court President Dorit Beinisch said the release of Gilad Shalit was not yet a done deal, at the end of a hearing before the High Court of Justice opposing the military censor’s blackout on the details of the proposed prisoner swap with Hamas. Beinisch spoke following a briefing given by defense officials to the justices hearing the case. The petition was filed by bereaved parents and Almagor, an organization that represents terror victims. The petitioners contend that military censorship has made real public debate on the details of a prisoner exchange deal for Shalit’s release impossible and that no information has been provided regarding whether the killers of the bereaved family members’ loved ones are among those expected to be released. Beinisch told the petitioners, however, that if a deal does take shape, representatives of terror victims will be given at least 48 hours to express their reservations. Hamas Interior Minister Fathi Hamad said yesterday that his organization is working on the assumption that the deal to free Shalit will be carried out within two weeks. Al-Arabiya television reported that the German intermediary in the case arrived in Gaza yesterday to provide Israel’s latest response on the Shalit case. The Associated Press reported that the differences between Israel and Hamas now hinge on 50 prisoners, among a list of 450 names, which Israel refuses to free. The London-based Al-Hayat newspaper reported that Israel is also not prepared to release five women prisoners who were sentenced to life terms. Meanwhile, Gilad Shalit’s parents, Noam and Aviva, yesterday continued their round of meetings with cabinet ministers that they had begun last week in an effort to convince them to vote in favor of a deal for their son’s release. Officials at the campaign to free Gilad Shalit continue to maintain their media blackout.